This was the title of a call of the Jewish Voice for a Just Peace in the Middle East (EJJP – Germany) against the “strategic partnership” of the Congress organizers with the Jewish National Fund (JNF) at the 3rd Israel Congress on 10 November 2013 in the BCC in Berlin-Mitte. 80-100 protesters followed the call of the Jewish Voice and made clear on numerous posters, banners and leaflets, what the so called “green” policy of the JNF means for the indigenous Palestinian non-Jewish population in Israel and the occupied Palestinian Territories: Land robbery, ethnic cleansing, and apartheid. 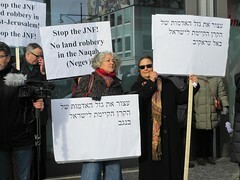 In Arabic, German, English and Hebrew, the protestors demanded “Stop the JNF; stop the Land robbery in East Jerusalem, in Silwan, in the Jordan Valley, in Al Arakib, in the Naqab. Efi Stenzler, World Chairman of the JNF, had to take note that the machinations of the JNF are known even here by more and more people. His attempts to appease the protesters by his point of view miserably failed when confronted with people who are not only familiar with the policy of the JNF in Israel / Palestine but also deeply affected. Ahead of this Congress the chairmen of the party-affiliated foundations, and the Alexander von Humboldt Foundation were asked in an open letter – supported by organisations worldwide – to withdraw their support of the 3rd Israel Congress. 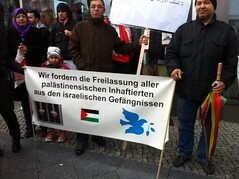 as well as the release of all Palestinian prisoners from Israeli jails.